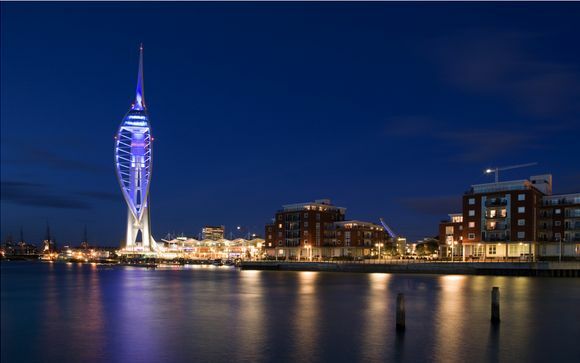 Portsmouth is an excellent example of a coastal city which has capitalised on its proud and interesting history. 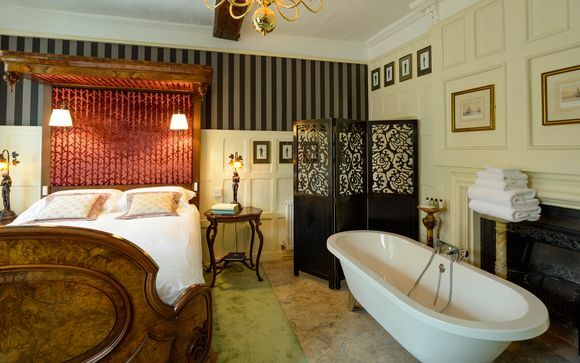 This Grade II-listed building is over flowing with character and history & this historic hotel is intertwined with the royal family. Each room alludes to Ye Spotted Dogge Inne's long history and is brimming with unique charm. This offer includes an Annual Dockyard Pass per person per stay which includes access to the Mary Rose & HMS Victory. Portsmouth offers a proud naval and maritime heritage, modern restaurants and shopping and and miles of beautiful waterfront. Here you can roam around three stunning historic ships, a submarine and an impressive cluster of museums. 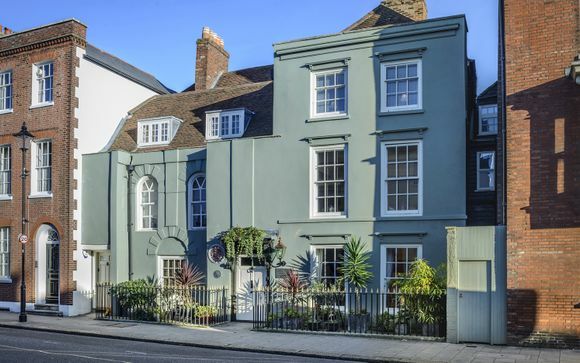 Ye Spotted Dogge is just a short walk away from major attractions including the Mary Rose Museum, H.M.S. Victory and H.M.S. Warrior at the Historic Naval Dockyard and the 170m high Spinnaker Tower. 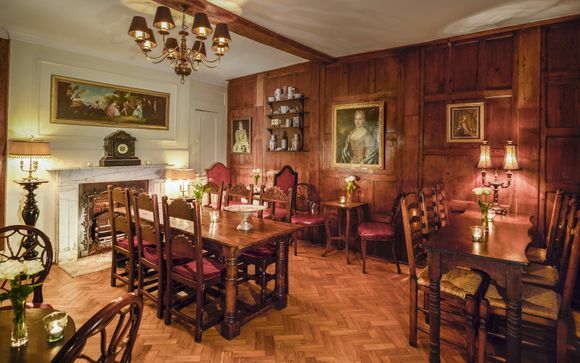 This Grade II listed building has an illustrious history stretching back to the 16th Century and has played host to everyone from royal lovers to Samuel Pepys. Its wood panelled rooms have witnessed so much of this travel hub's history and when you enter its cosy lounge you instantly feel like you stepped into a bygone era. There is also an enchanting courtyard where you can plan the next days adventures with a glass of wine in hand. Please note that this hotel is adults only. This offer is based on a Superior Double Room which will be allocated upon arrival. This bright room is styled in the image of a country house with Windsor Chairs & flower wallpaper, however the bathroom is anything but traditional with a extra-deep Boch bath & shower. Facilities include tea & coffee making facilities, a mini-bar and luxurious Egyptian Cotton. This sleekly designed room can be found on the first floor. 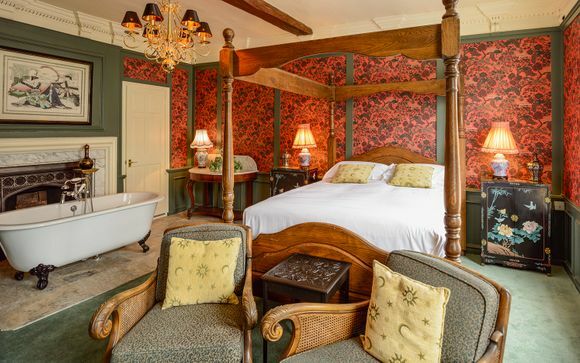 Its richly decorated red wallpaper contrasts beautifully with the soft grey panelling while the large four poster bed promises a peaceful nights sleep ahead. As the name suggests, this room pays homage to Britain's love affair with the far East. 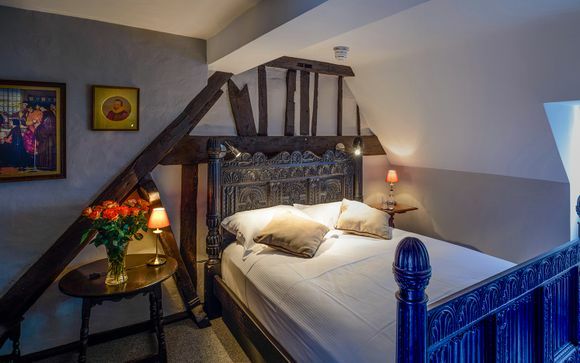 On the second floor you will find a characterful room with a sloping ceiling and exposed wood beams. Relax on your elaborately hand-carved Tudor bed and make the most of your modern bathroom with a Philip Starck designer bath. This regal room is dominated by king-sized walnut bed and looks out onto a peaceful garden view. A standout feature of this room is the free-standing bath and period fireplace hidden behind an elaborately carved room divider. Just for you: A complimentary glass of champagne upon arrival & a cocktail in the bar. 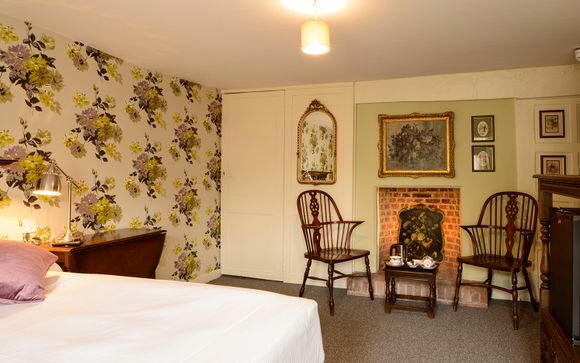 Ye Spotted Dogge is a cosy warren of guest lounge, breakfast room and old-fashioned bar where you can make yourself at home in front of the roaring fire and admire the antique, gold-framed artwork which adorns the walls. The exposed beams, antique furnishings and historic nick-knacks create a veritable time capsule. This offer includes a 24 hour parking permit per day of your stay. Distance between Portsmouth Harbour Train Station & Ye Spotted Dogge: 5 minutes / 1.5km by car or 15 minutes / 1km by foot.